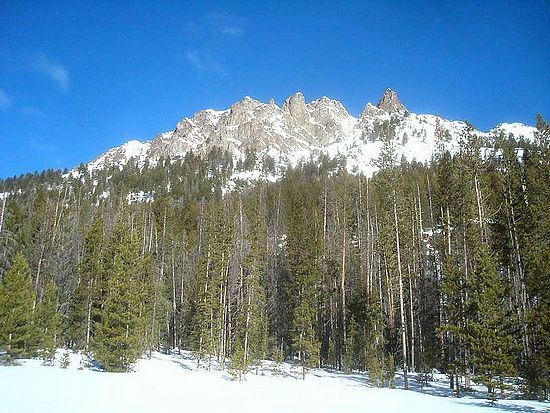 Peak 9367’ is a complex mountain located near the southern end of the Sawtooth Valley. The approach from the highway is relatively short, with a packed snowmobile trail for easy snowshoeing up Frenchman Creek. The peak itself is made up of a number of rock towers that give it a lot of personality. After a 4am departure from Boise, and a quick drive up to the Galena Overlook to get a bird’s eye view of the peak, we were on our feet and making our way up Frenchman Creek before 8am. The plan was to head up Frenchman Creek to the base of Peak 9367’s east face, and then make our way up a gully that John had spotted on the map. Sean, Splattski, and I made good time heading up the packed snowmobile track, with no need for snowshoes thanks to a firm crust. It took us about an hour to cover the 2.5 miles to the base of the peak, and then it was time to start climbing. The snow was softening up as we climbed, so it wasn’t long before we donned snowshoes. This helped keep us from sinking in, but they were cumbersome on some of the steep side-hill sections. After an hour of climbing, we reached the bottom of a really cool gully that sliced its way up the face. John and I kicked steps and Sean used crampons to climb. We could tell the gully was taking us to the ridge just north of the peak. This was a really fun section, and the weather conditions were excellent. We were feeling optimistic about the day until we reached the ridge and got our first clear view of the summit block. It was a steep knife-edge ridge, with cornices overhanging both sides. None of us had a rope, and we decided the risk was just too great, so we decided to head back down the gully. Once back down at the base of the gully, we talked each other into circling around to the south ridge to try our chances from that direction. The snow had gotten pretty soft by this point, some we partook of some premier wallowing in the sometimes waste-deep snow. Great fun. We eventually got to the south ridge, and had a snack while enjoying the weather and great views. Next it was time for some scrambling. We couldn’t see the summit from here but we couldn’t see any obstacles either, so up we went. It was fun rock scrambling, especially compare to the earlier wallowing. After a couple hundred feet of climbing, the summit block came into view. It was quite ominous, with steep rock along the ridge, and cliffs on either side. Needless to say, today wasn’t our day to summit. So down we went, carefully making our way down the ridge, followed by some fun glissading, and some more wallowing before reaching the base of the peak. Other than not reaching the summit, this day had everything I could have asked for. Great friends, great weather, a cool gully snow-climb, some good scrambling, and even a glissade thrown in. Map of our route, 8 miles round trip and 2300' elevation gain. Starting our way up from the base of the peak. John climbing the neat east face gully. View toward the headwaters of Frenchman Creek, from the east face of Peak 9367'. John and Sean nearing the top of the gully. The scary summit block. Steep snow on a knife-edge ridge with cornices overhanging on both sides. Wallowing our way around toward the south ridge. Sean and John heading up the south ridge of Peak 9367'. Fun scrambling on the south ridge. View to the summit, time to turn around.